Cyndi and I went to Colonial Williamsburg on Memorial Day. Here is a link to the pictures we took. Enjoy! If you work in IT at a publicly held company, your life was changed dramatically late last year and early this year. You know what I'm talking about…SOX. You also know how "symbolism over substance" what companies are doing is. You know it doesn't really do anything but make your life harder. It makes it harder to do your job. It makes it harder to server your customers. Everything is called SOX. Everything falls under SOX. Leave the desk for 10 minutes and the computer screen goes dead. Why must I sign in all over again? "Sarbanes-Oxley," says the poor soul in the tech department. This all-powerful Sarbanes-Oxley turns out to be a law Congress passed in 2002 after the Enron collapse to protect investors by forcing publicly held businesses to more accurately report information about themselves. Nothing in the law specifically requires companies to turn cubicle life into a journey through the stages of hell. But that's how the law is being interpreted across the land. Sen. Paul Sarbanes, the Maryland Democrat who is retiring next year, has had to watch what he thought of as a guardian of ordinary investors' assets being transformed into a scapegoat for all things annoying at the office. "You have some way-out requirements, and the company says that's what Sarbanes-Oxley says we have to do, but these changes are neither in the act nor in the regulations implementing the act," Sarbanes tells me. "I don't know where some of these things came from." "It's absurd how the law is being used to justify these silly timeouts and constant demands for you to type in your password. The law is just being used as an excuse for placing restrictions on workers." Sarbanes sighs at how his name is being taken in vain as a nation of office workers grouses about new incursions on their time and sanity. "Some people in the business world think it's unnecessary regulation," he says, "but look at the price we paid with Enron and those scandals in losses of jobs and confidence in our capital markets. We didn't set out to create onerous requirements. We were confronted with these gross abuses, and we set out to protect the American investor." 1. The law needs to say what is meant. 2. Business will take symbolism over substance to try and comply with what the law says. So, we need smaller government and business that thinks. Alan sent me a link to this today, and I think it is cool. The possibilities are endless! Just to make sure of what I was seeing, I refreshed my browser. Nope, they did not change their logo. 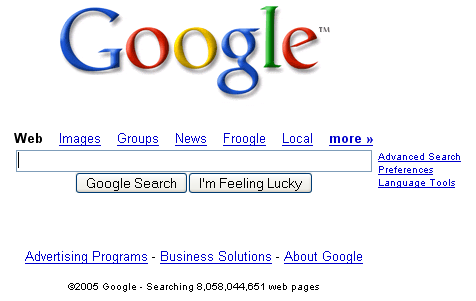 Why didn’t Google change their logo today? Google, I call on you to issue an appology, change your logo, and honor those who have served, fought, and died for our freedom. Is Google liberal? I don’t know, but it is certanly looking like it. First they refuse conservive adds now this. Does anyone have any idea of an alternate search enging that is as good? [Update 10-10-2007 05:44:56] I found a contest where an individual sponsored a contest to help Google develop a log for Memorial Day. Here is a link to the post where I talk about that. Even though I have left NiSource, I still want to keep up on the outsourcing so I talk to friends regularly. I have heard that IBM has started the interview process. Of course, all the company says is some people will stay NiSource, some will be rebadged, and others will loose their jobs. At the outset of the project, the employees were supposed to know by the end of May what was going to happen. Well, that has been pushed back to the end of June. Good luck to all at NiSource! To see pictures of our new house in Richmond, go to http://techs4jesus.dynup.net/webpics/200505RichmondHouse/. Enjoy! I'n sure everyone has heard the hymn Eternal Father, Strong to Save. Did you also know that it is The Navy Hymn? Did you also know that verses have been written covering just about every job in the US Navy? Well, if you have never been to chapel on a military base, you may not; however, it is true. Several years ago, my mom asked me if I knew where she could get verse such and such. I didn't think it would be that hard but it was. It took me a few hours to find all the verses. I eventually found them on a US Navy site (somewhere). Because I think it came from a US Government source, it is public domain; however, it may not be. If you are the/a copyright owner and you want your verse/the whole thing removed, send me an e-mail. Today the US is celebrating Memeorial Day. It is a day set aside to remember those who have served, fought, and died to preserve our freedom. Without their sacrifice, who knows our country would be like. Today, WorldNetDaily.com is reporting that a christian student painting an art mural is being told he cannot. When Napa High School senior Kyle Trudelle began his art project – a mural depicting steps leading to a castle in the clouds – he didn't imagine some students would start a petition to stop him for violating the separation of church and state or school officials would order him to put down his brush while district lawyers reviewed the matter – particularly since there was already an adjacent mural depicting Our Lady of Guadalupe, an important religious figure to Catholics and the large portion of the student body of Mexican decent. Kyle, I support you. Don't change the painting. Stand up for what you believe. Be bold! Last night, Cyndi and I went back to Staples Mill Road Baptist Church for their Sunday Evening Service. On Sunday Evenings, the interm pastor is going through the book of Acts. Last night, he brought a message on boldness. His text? As Christians, we are going to be put in hard situations. All around the world, Christians are persecuted for what they believe. Here in the US, we are intimidated. Our reaction should be to pray for boldness! We shouldn't back down! Continue going forward! We shouldn't go looking for trouble: we shouldn't walk up and punch someone in the face. However, when trouble finds us–someone says quit speaking about Jesus or I'll punch you in the face– we should be bold and continue to speak!